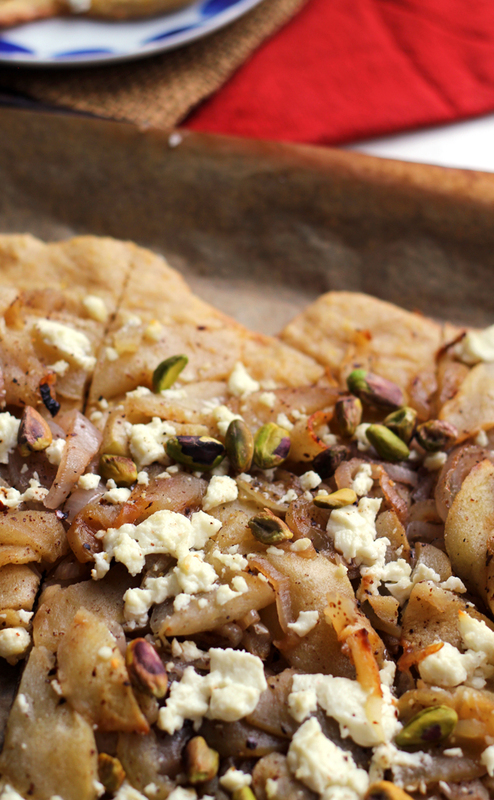 Served as either an appetizer or a light first course, this roasted apple, shallot, and goat cheese tart is rife with sweet and savory flavor with a hint of Middle Eastern seasoning. Perfect for holiday eating! I’m gearing up for this weekend, both mentally and physically. We’re hosting our annual Ugly Christmas Sweater party on Saturday, followed by what should be a day of rest on Sunday but is looking to be more like a day of profound anxiety. Because….I AM LEAVING REMY OVERNIGHT. I have to take an 8 hour standardized test on Monday in Philadelphia and while, don’t get me wrong, I totally considered dragging her and a grandparent along for the ride, common sense (and the.boy) convinced me that (a) it was only one night, (b) she would survive, and (c) it was probably in her best interest for her to be at home on Monday with her nanny who she adores instead of stuck in a strange hotel room with none of her toys. If you need me, I’ll be hyperventilating into a paper bag until I’m back home on Monday night. I can’t tell yet if hostessing on top of all of this is either a good or a bad idea, but it’s probably both. Bad because I can’t seem to focus on anything, let alone cooking all the things. Good because hopefully it will distract me by forcing me to spend my time cooking all the things. And what could be more distracting/stress relieving than digging your fingers into a mound of dough!? While holiday cooking certainly can be all about the daunting and over the top recipes, it can also be about keeping it simple with good quality ingredients. This tart does exactly that! It pairs a yeast crust that gets a bit of crunch and nutty flavor from a blend of all purpose flour, whole wheat flour, and cornmeal with a roasted apple and shallot mixture that is seasoned with Pompeian Unfiltered Organic Apple Cider Vinegar, aleppo pepper, and sumac, all of which come together to really bring out it’s sweet tart and savory flavors. 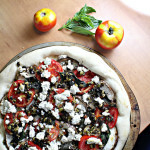 It is then topped with creamy goat cheese that melts in your mouth with every bite. 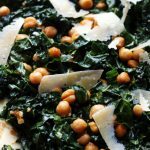 While you can cut this into smaller pieces and serve it as an appetizer, it can also be served as a first course when divided into larger squares. 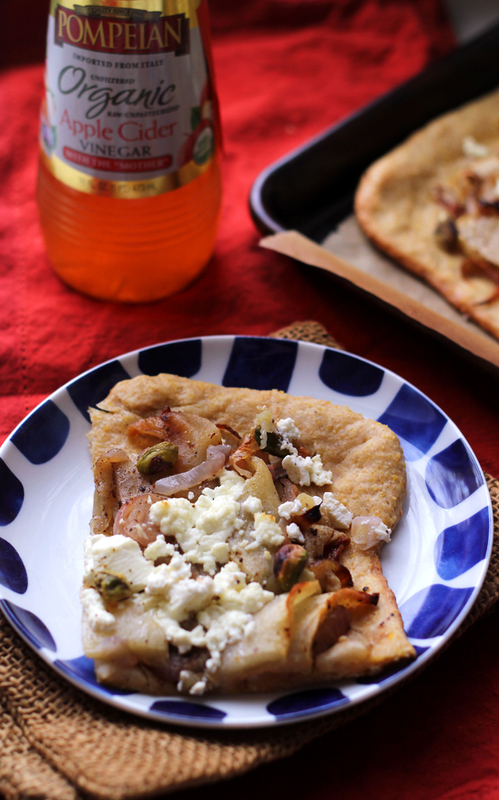 I love using Pompeian’s extra virgin olive oils and organic vinegars in my cooking because their commitment to quality and authenticity can truly be tasted in every bottle! Not only does Pompeian work with multiple third parties to ensure the quality of its products, but it is the first national brand to carry the USDA Quality Monitored Seal on its extra virgin olive oils and it is a longstanding member of the North American Olive Oil Association. This same attention to detail certainly comes through in its line of organic vinegars as well. Pompeian Organic Apple Cider Vinegar is especially versatile in that it’s not just good for cooking, but for maintaining digestive and immune system health as well! Drinking just two tablespoons of Pompeian Organic Apple Cider Vinegar combined with the mother that settles at the bottom gives you a high dose of polyphenols, which help to improve digestion and boost the immune system. Two for one – good flavor AND good for you. Can’t beat that! To make the crust, whisk together the yeast, sugar, and water in a small bowl. Let sit for 5 minutes to activate the yeast. It should become foamy. In the bowl of a stand mixer fitted with the dough hook attachment, combine the flours and sea salt. Stir briefly to mix. Add the yeast mixture and olive oil to the bowl and mix on medium-high speed for 5 minutes. Transfer to a lightly oiled bowl and cover loosely with plastic wrap. Allow to rise until doubled, or about 1 hour. Meanwhile, heat to the oven to 425F. 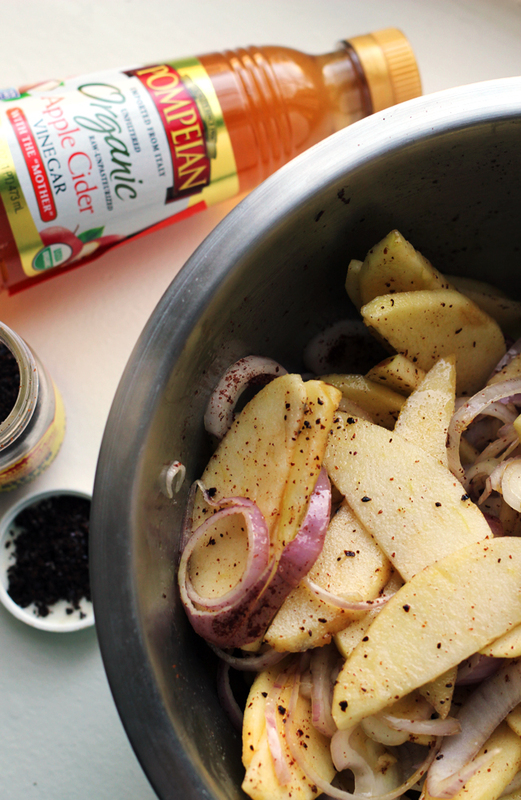 In a large bowl, toss together the apples, shallots, olive oil, vinegar, aleppo pepper, sumac, and salt. 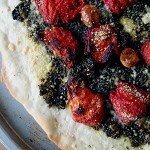 Spread on a parchment-lined baking sheet and season with freshly ground black pepper, to taste. Roast until tender and golden, about 30 minutes. Increase the oven to 450F. Line a baking pan with parchment paper and lightly grease with olive oil. Punch down the dough and move to the baking sheet. Using either a rolling pin or your hands stretch the dough to an even layer that is about 3/16-inch thick. 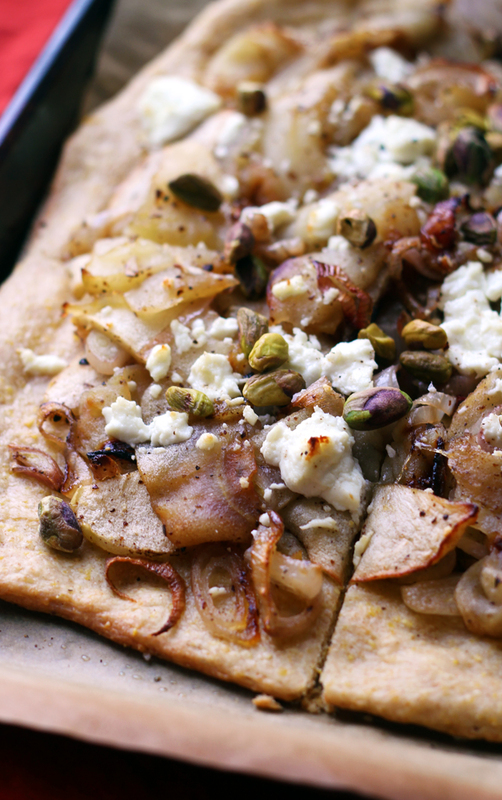 Scatter the roasted apple-shallot mixture over the crust. 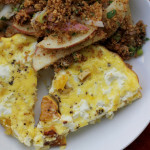 Crumble the goat cheese over the top. Season with flaky sea salt. Bake until the crust is golden brown and the cheese is melted, about 17-20 minutes. 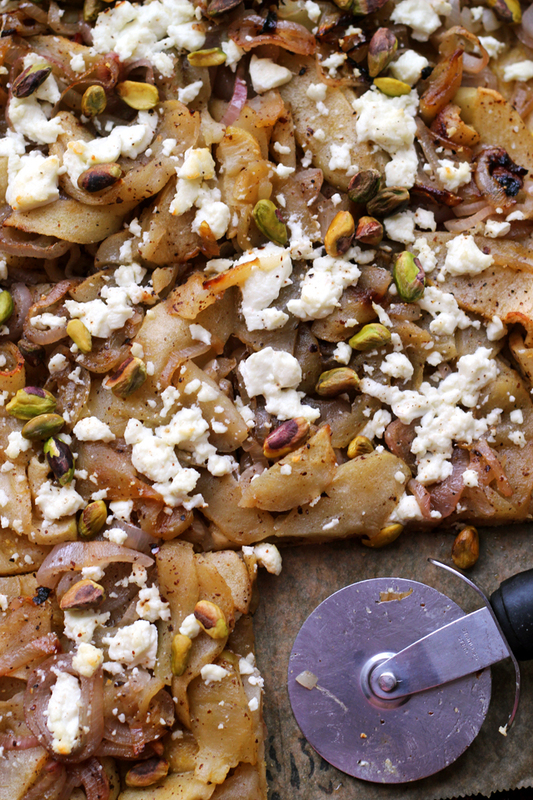 Scatter pistachios over the top. Let cool for a few minutes before cutting and serving. She’s going to do great, you’re going to do great. Giod luck! Good luck on your test! I’m sure Remy will be great at home 🙂 yummy tart! The tart looks amazing and is it bad that I want it for (second) breakfast right now? Oh honey, I understand! My kids are 10 and 8 and I still don’t like leaving them! That first time is always the hardest, but you’ll get through it. Suggestion: take some of this tart with you and eat your feelings! Looks amazing. WHAT. This looks freaking amazing. Leaving them overnight is no easy task but you both will be fine. Good luck on the test! The tart looks AMAZING!